If you’re like me, you lament the fact that buttermilk is only available in quart-sized containers. I mean, really, you can buy a pint or half-pint of cream, heck, you can even buy pint of milk these days, but only full quarts of buttermilk? 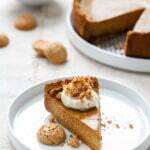 If you’re also like me, buttermilk isn’t exactly the most commonly used item in your kitchen. 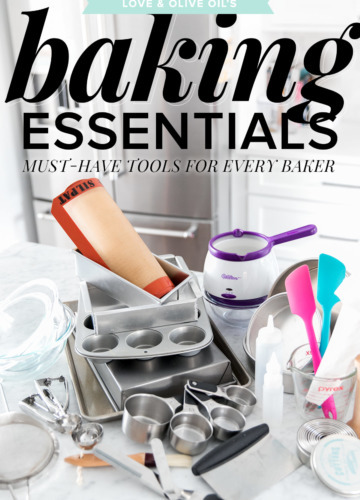 You need it every now and then when you are making some biscuits or pancakes or chess pie, but those use maybe a cup or two at most. Sure, since buttermilk is already slightly soured it does last longer than regular milks, but it won’t last forever. And if you’re (once again) like me in that you feel the good, full-fat stuff is well worth the extra money, you don’t exactly like the idea of wasting it. 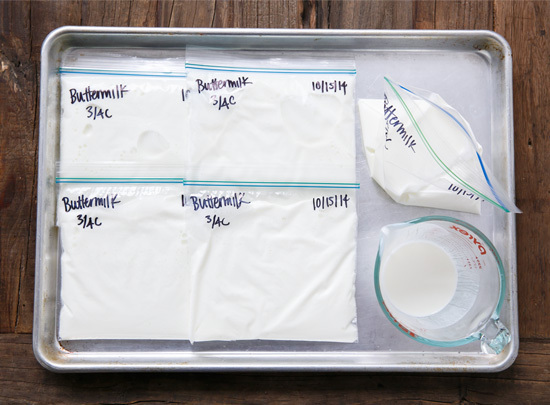 Luckily, freezing buttermilk is incredibly easy, and if you measure it out according to what you most use it for, (3/4 cup for one batch of biscuits in my case) you can thaw it out as needed. First, make room in the freezer. You’ll want space for a cookie sheet to lie flat and level in your freezer. I find arranging a bunch of boxes of waffles and bags of frozen fruit to form a sort of level platform. But maybe your freezer is more orderly than ours (it wouldn’t take much) and you’ve got plenty of space. If so, lucky you. You should really freeze more stuff. Label your bags. I recommend including the description and amount of what’s inside, as well as the date. Because no matter how good you think your memory is now, you will not remember what that random bag of stuff is in 4 months. I promise you. Labeling is your friend. 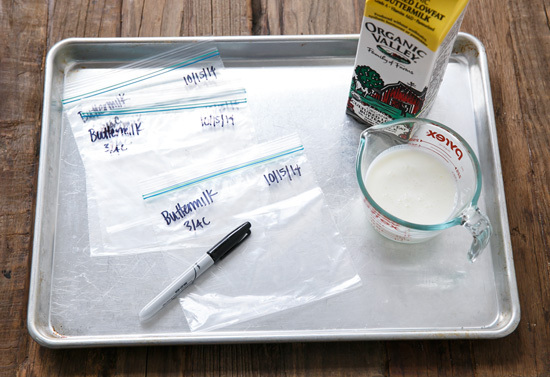 Portion out your leftover buttermilk into the labeled bags. Fold them over to press out any remaining air inside, then seal and lay them flat on a cookie sheet. Why flat? Well, they’ll freeze that way. And then you can stack them up nice and neat in your freezer, alongside your egg whites and tomato sauce and basil pesto (which you can also freeze the same manner). Like your own little frozen foods library. 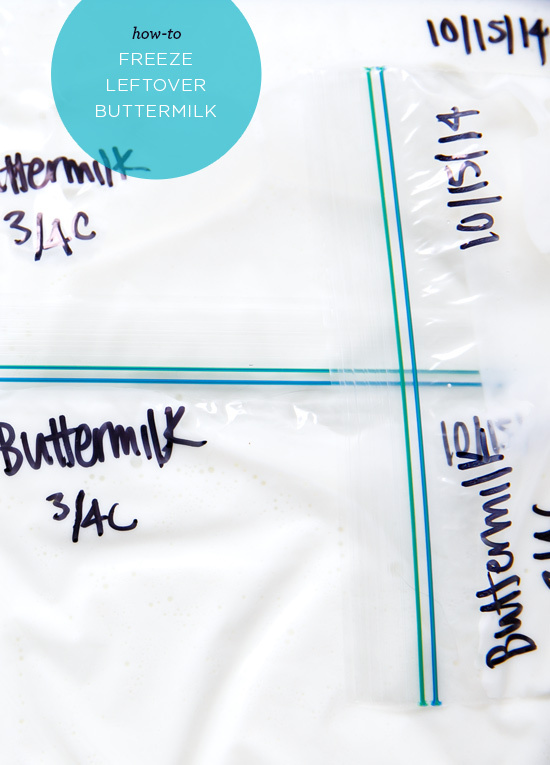 To thaw your buttermilk, just put the bag in the fridge overnight until it’s thawed. Or, if you’re like me (and really, most of you probably are in this sense) you forget to thaw it ahead of time and need to use it immediately. Fill a baking pan with lukewarm water and submerge the bag. Swap out the cold water for new lukewarm water once or twice as needed, and in about 20 minutes your buttermilk should be totally thawed. That’s another benefit to flat-freezing: much quicker thawing times than if you were to freeze them in a blocky container. Thanks for the great idea. I should have thought of this, my mother used to freeze milk all the time when we were kids. I use a lot of buttermilk, but occasionally have to throw a bit out. No more! Now I won’t throw it away. I love this idea.. also wanted to point out this great mini-cookbook from Short Stack Editions (i have no affiliation with them, but I do love their mini format) – http://shortstackeditions.com/store/coming-soon-vol-4-buttermilk-by-angie-mosier – which includes a lot of other ways to use buttermilk throughout the year, and beyond just pancakes and biscuits. I have not had much luck freezing buttermilk. I froze it in ice cube trays, then placed in plastic bags for storage. When thawed, the milk separated. You know, I’ve noticed a bit of separation but nothing that prevented me from using it in biscuits or anything. I guess it depends what you’re using it for. something every day if your lucky. Great ideas. I am single and never use a whole can or container of anything. My only suggestion is to thaw under cold running water, as recommended by Servsafe, a leading food safety training program. They do not recommend thawing with warm water. I agree for larger things like frozen chickens or meat. 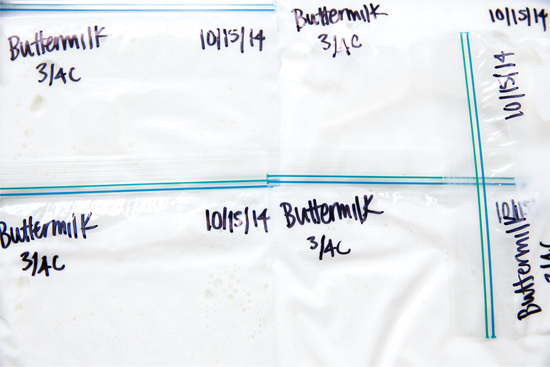 However a bag of buttermilk thaws so quickly that it’s hardly long enough for any sort of spoilage/contamination. It wouldn’t be something I’d leave it out for longer than 20 or 30 minutes. I’ve frozen buttermilk to use in baking recipes in the past and found that it is not the same as fresh buttermilk. 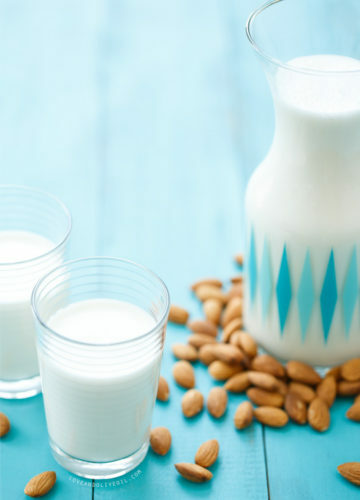 As a commenter posted out earlier, the milk and fat separate and it’s impossible to re-emulify. Does anyone have a trick that will eliminate the separation problem? Is fat-free or reduced-fat buttermilk less likely to separate? I’d appreciate your feedback. I’ve noticed a bit of separation on occasion. I’ve only frozen the full-fat good stuff, so maybe it’s the fact there are no stabilizers or homogenizes in there and the separation is normal. I even notice it separating sometimes just in the fridge in the bottle. However, it doesn’t really affect its usage, at least when I’m using it for biscuits. I guess maybe it depends on what you’re using it for. Love this! 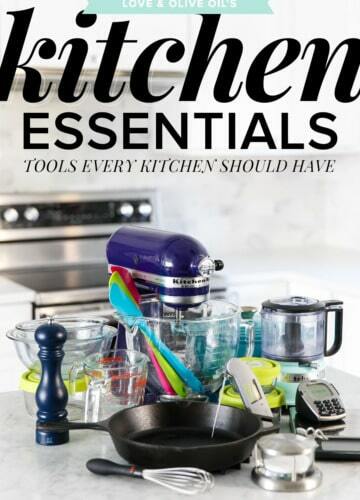 I totally agree with everything you just said and am about to go into my kitchen and check to see if the buttermilk I have on hand is even useable for a recipe I want to make but I doubt it. So, off to buy more. And use 1/2 cup. And then….I will be freezing the rest. Thank you and pinned! Wow this is awesome, I definitely have the same struggles as you with buttermilk. I didn’t even know you could freeze it! Awesome tip. For this very reason, I rarely buy the large cartons of buttermilk. I never go through it! Instead, I tend to make my own buttermilk substitute for recipes by adding 1 Tbsp of lemon juice (or if I am really in a pinch for ingredients, white vinegar) to 1 cup of milk. Or I have even had a lot of success by really messing with recipes and substituting the buttermilk with some plain yogurt that has been thinned down with a bit of milk. I find the yogurt even makes some recipes taste better. That being said, I appreciate this article -I will keep it in mind for the next time I commit to buying buttermilk! I’m off to do this RIGHT NOW! Thanks, Lindsay! Such a great tip! I love freezing things flat for the exact reason you said…I have a little catalog of soups and sauces in my freezer right now! I just bought a quart of buttermilk for Thanksgiving cornbread and was wondering what to do with all of that leftover buttermilk… thank you! How long can it be stored frozen and still be good? I probably wouldn’t use it beyond 3 months or so. great idea. i must remember that- even tho buttermilk in australia comes in 600 mls cartons. 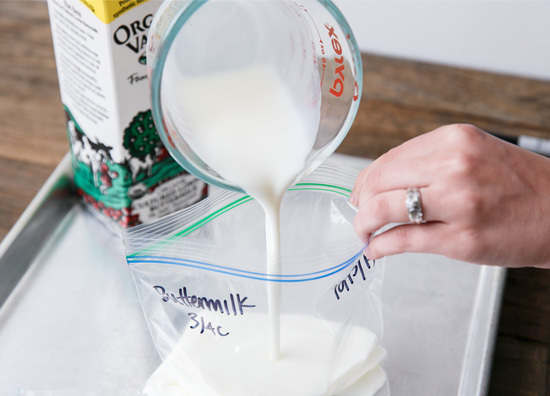 Would there be any difference if I used a bag of milk from one time I froze a bag of milk, and then another time? So if I used one bag from month A, and then another bag from month B. Or would there be no difference since everything is frozen, even though they’re frozen at different times? Someone may have already suggested : You can do this another way using an ice cube tray. A regular tray section holds about 2 TBS but there trays are available with sections that hold 1/4 cup each. 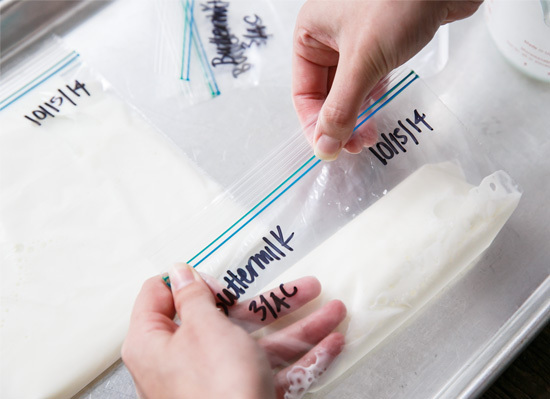 Once the milk is frozen, release the cubes and store in a plastic bag. You can then defrost as many as necessary to equal the amount required for your recipe. Flat freezing…what a wonderful idea! Saves tons of freezer space and defrosts quickly. I always have buttermilk on hand because it’s a staple in our house. Besides baking, I use it as a brine/marinade for chicken, fish and calamari, etc. before breading & frying,. 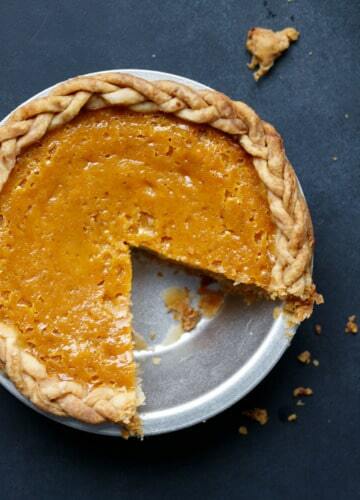 Tangy, tenderizing and delicious. Try it! I also use it for making my homemade ranch dressing. I probably go through more buttermilk than most people and I STILL end up throwing some of it away every time. Thank you SO much for the plastic bag tip. Gonna go freeze some right now! Is the taste and texture of thawed buttermilk still good for making ranch dressing? I think so – since you’re making an emulsion with the dressing anyway it should resolve any possible curdling resulting from the freezing. So excited. I have never used butter milk before, and now I’m making my ranch dressing… super excited I don’t have to keep waisting this stuff! Thank you for this feed! Lynn, did you try making the ranch dressing with the frozen buttermilk? How was it? 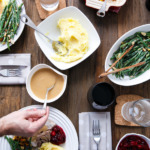 Love this – wasn’t sure you could freeze buttermilk, but since I freeze all kinds of cheese, I decided to look it up, and there you were – Thank you! I AM LIKE A LOT OF OTHER PEOPLE AND ONLY USE ABOUT HALF OF THE BUTTERMILK. here in nh,hanneford’s sells pints of buttermilk. Everything you said was me from your passing thoughts to freezing pesto sauce. I really love freezing things flat for the exact reason you said…I have a small catalog of soups and sauces in my freezer right now! Great idea!! Thank you for sharing!